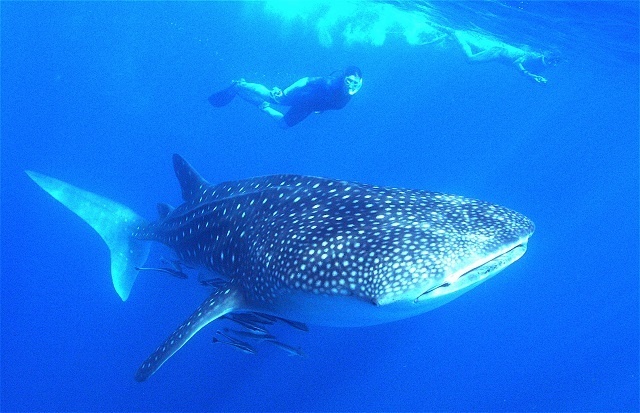 (Seychelles News Agency) - Whale sharks -- majestic creatures that are also the world's largest fish -- moved into the waters of Seychelles earlier than normal this year, an official of the Seychelles National Parks Authority said. The large sea creatures, known in Creole as ‘sagren,’ typically move through Seychelles’ waters in September and November in search of feeding grounds of plankton. But this year, they were spotted in July. According to research officer Isabelle Ravinia, sightings were recorded in July in two marine parks -- the Cocos Island -- located 7 kilometres north of La Digue, the third-most populated island, and Baie Ternay, which is 5 kilometres southwest of the main island, Mahe. 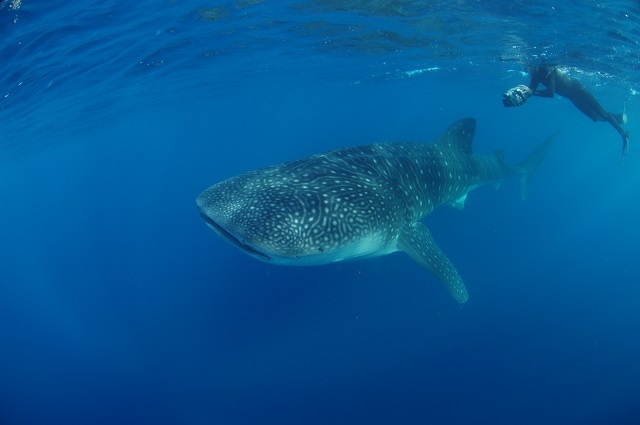 With the recent sightings of the whale sharks in two marine parks accessible only by boat, Ravinia said anyone interested in seeing the sharks can contact local dive centres and tour operators. Whale sharks are the largest fish in the world, and they are not whales although they have the massive size and also feed on plankton. They are in fact sharks and bigger than the great whites. They can grow up to 12 metres and weigh up to 20 tonnes. In the past, whale sharks could be sighted close to the Seychelles’ main islands -- Mahe, Praslin and La Digue -- but this has not been the case for the past two years. Rowat said that this meant that although there is still a lot of plankton around the main islands, the whale sharks can now find plankton near the outer islands. The chair of the Marine Conservation Society Seychelles added that “there are currently no monitoring or conservation programmes being conducted in the Seychelles for whale sharks.” The MCSS's whale sharking monitoring program ran from 2003 to 2015. The programme was funded by tourists and interested individuals visiting the whale sharks by boat which made the programme dependent on the presence of the species in the Seychelles’ waters. Due to the low number of the sharks passing through the Seychelles for the past two years, it has made conservation and monitoring very difficult. “It is still essential to monitor natural populations to know the status of species and to help improve management decisions if ever there is a large change in the species’ status,” Rowat said. As the population of the whale sharks continues to go down, the International Union for the Conservation of Nature (IUCN) has classified the species as endangered. As they are solitary creatures, not much is known about these types of sharks and their social habits, and IUCN said they have not been studied as well as other sea creatures. The Marine Conservation Society Seychelles hopes that if ever the whale sharks do return towards the main islands, the government will provide necessary support and follow through with the international guidelines and regulations for the visitation of whale sharks.